US Indices ended marginally lower on Thursday as markets are on edge ahead of today’s start of earnings season. Upbeat economic data showed an increase in PPI figures and jobless claims fell to a 50-year low highlighting the resilience of the US labor market thereby lifting sentiment and resulting in a rise in treasury yields. On the Sino-US trade front, there’s been reported progress which hasn’t sparked much reaction given that a deal hasn’t been agreed yet. Markets will look to course of earnings season for hints on the pressure of global trade uncertainty on corporations and to determine the US’s economic outlook. Today, in terms of data we have consumer sentiment reports and earnings reports from the banking sector which should dictate near-term direction and result in market volatility. The Dow continued to trade sideways on Thursday and retreated to 26030 intraday before ending marginally lower at 26143. 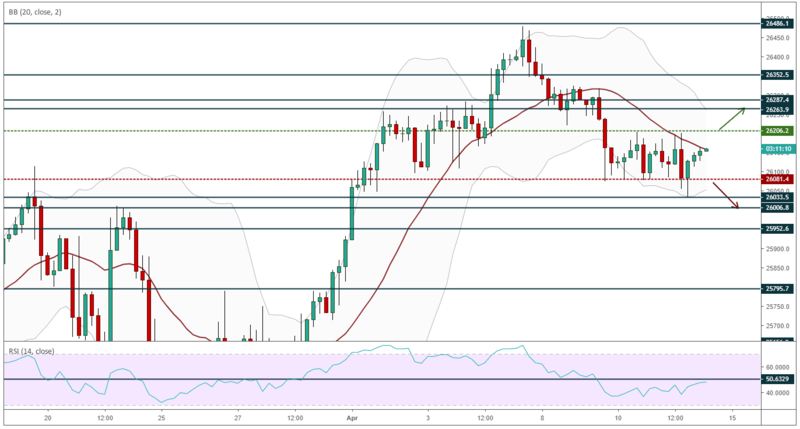 While the bullish outlook still holds, short-term price action is neutral and the index has failed to trade above the 26200 level to suggest buying pressure and a move towards resistance at 26260. Moreover, the price remains below the 20-period MA and the RSI reading is hold below the 50 mid-line suggesting that the index could drift lower. A decline below the 26080 level will confirm bearish price action should this level prove to have turned to newly found short-term resistance. Direction on the Dow should be determined by markets’ reaction to today’s earning reports.